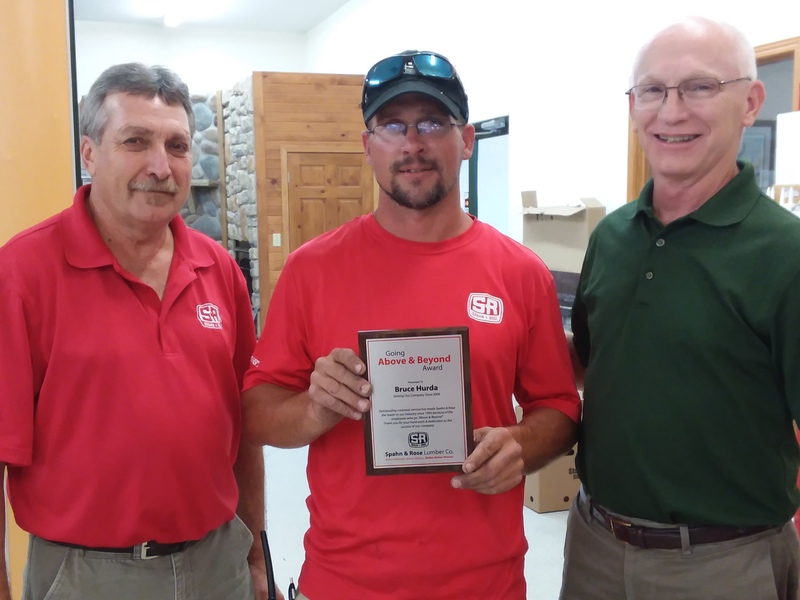 Bruce Hurda Goes Above & Beyond Every Day - Spahn & Rose Lumber Co. Sometimes Bruce Hurda’s day begins in the wee hours of the morning, about a half hour north of the Spahn & Rose store in Prairie Du Chien, Wisconsin. Because of Hurda’s deep, on-going commitment to customers, he recently received the Spahn & Rose Above & Beyond Award. In addition to his early-morning material drop-offs, Hurda also has an in-depth product knowledge and can guide contractors to the best products to finish their jobs, often helping find products that will work well with older homes near Prairie Du Chien. When Hurda isn’t helping contractors at the Prairie Du Chein Spahn & Rose location (or in the early morning hours), Hurda is an avid outdoorsman and enjoys bow hunting whitetail in the fall and bow fishing during the summer. When customers submit a review, employees mentioned are nominated for the Above & Beyond award. Employees earning the award receive a plaque honoring their achievements and a $100 Spahn & Rose gift card.